Obituary for Steen Konrad Anderson | Minnis Chapel, Inc.
Steen Konrad Anderson of St. John, KS, passed away peacefully on April 14, 2018 at KUMC Kansas City, KS. Steen was born to Fern Elizabeth (Harris) and Morris Anderson on September 4, 1957, in Wurzburg, Germany. He graduated from Wayne High School in 1975 and farmed and transported livestock and grain following his graduation. He moved to Franklin, NE and continued to do trucking for about 9 years before moving to St. John, Ks. In 1995, he and a friend formed a business that owned and managed heavy equipment for construction companies. He sold this business in 2009 due to severe health reasons. 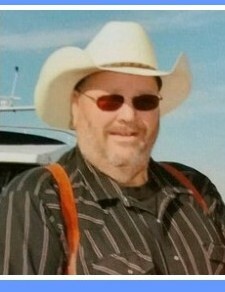 Steen was an optimistic, kindhearted gentleman who loved the simple lifestyle of the Midwest. He was strong and determined and would help anyone in need. He had a tremendous sense of humor and could have everyone laughing within minutes of meeting him. He is survived by the love of his life, his fiancé Phyllis McKelvey of St. John, KS. Other survivors include a son, Konrad (Lauren) Anderson of Franklin, NE, Father, Morris Anderson of Stillwater, MN., sister, Signe (Nick) Markell of Stillwater, MN, niece and nephew Grace and Aaron Markell, future son-in-law, Nick (Rebecca) Vanhorn and family of Wayne, NE. He will be sorely missed by his beloved dog, Piper, as well as aunts and uncles, cousins and close friends. He was preceded in death by his mother, Fern Elizabeth Anderson and Grandparents Anderson and Grandparents Harris. A celebration of life visitation will take place from 5-7PM on Thursday, April 26, 2018 at the Minnis Chapel, St. John, KS. Inurnment service will be 2:00 PM, on June 23, 2018 at the Axtell, NE City Cemetery.